The covered call option strategy is a mildly bullish options trading strategy that involves selling a call option on an underlying asset while simultaneously owning the underlying asset. Selling, a.k.a. 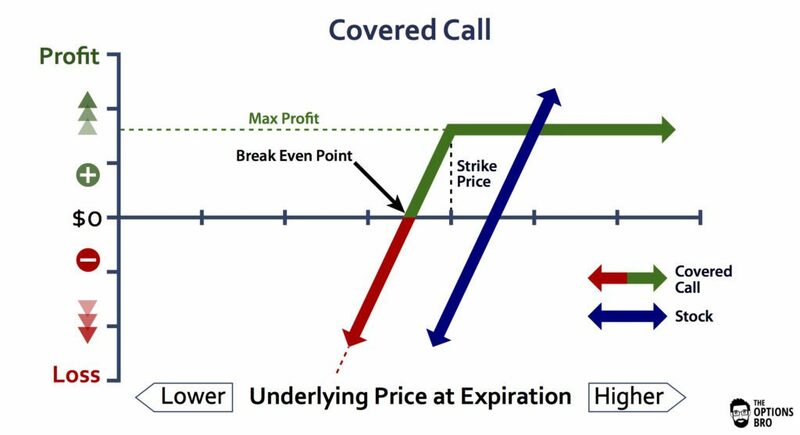 writing, covered calls enables traders to reap all of the benefits of selling naked calls but avoid the potentially catastrophic undefined upside loss. Covered calls are much safer than naked calls because the potential forced short sale is “covered” by owning the underlying asset. Moreover, they are a very popular way to generate income by selling options, as the short call will either expire worthless or will expire ITM. If the latter situation occurs, the long underlying position will be profitable and the trade will still be a winner. It’s kind of a win-win. Out of every online broker with 24/7 customer service in 2018, Ally Invest the has the lowest commissions to trade the covered call strategy as well as the best free options trading software. Read the Ally Invest Review. Note: like most options strategies, covered calls can be sold in-the-money (ITM), at-the-money (ATM), or out-of-the-money (OTM). Writing covered calls that are ATM or OTM is by far the most popular. In the example above, the max loss is limited at stock XYZ going to zero. It’s almost not fair to label the max loss for the covered call strategy as “underlying goes to zero” because this could happen with any long stock position. The only true “risk” that a covered call has is that the underlying asset will be “called” away due to a rally in the asset’s price by the time expiration approaches. There is no upside risk with a covered call. However, the total gains for XYZ will be capped at the strike price of the short call. 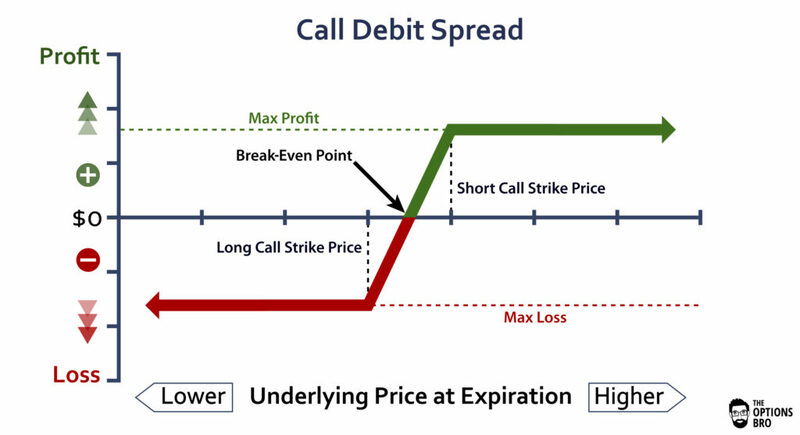 Meaning, if XYZ trades past the strike price of the short call at expiration, it won’t be of any additional benefit; this could be potentially considered a form of risk. 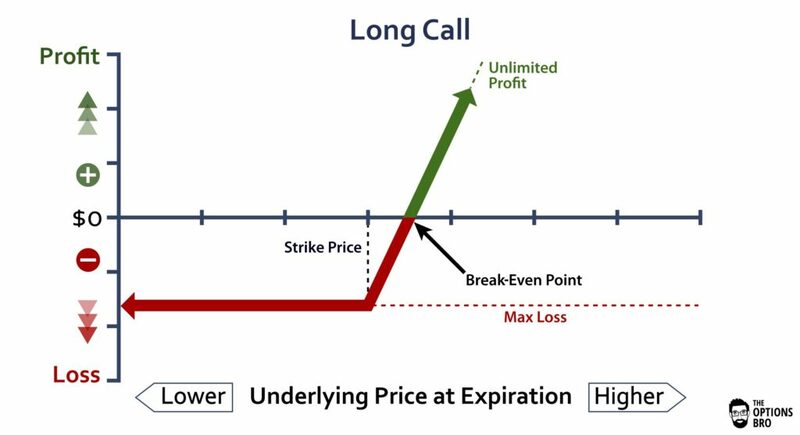 If XYZ is not at or past the short call strike price at expiration, all of the the option premium will be kept and the long stock position will be intact. The break-even point for the covered call option strategy is very simple. 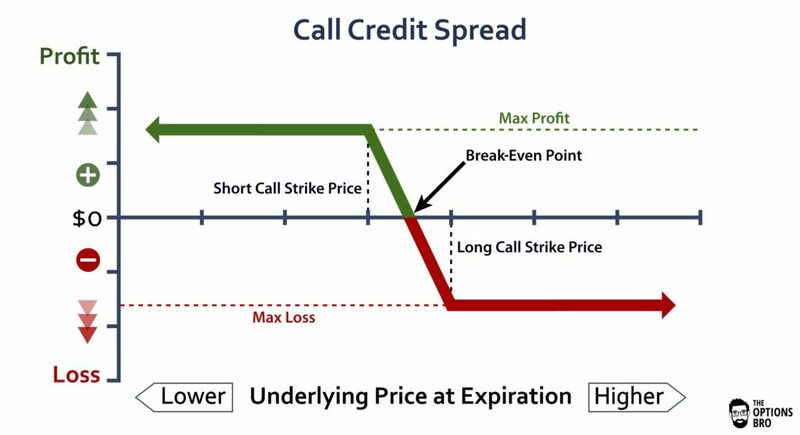 Because selling covered calls involves owning the underlying optionable asset, like a stock of futures contract, the break-even point is merely the price paid for the underlying asset minus the value of the premium received from the sale of the short call. In the case of stock XYZ, the break-even point is $49.70. The main logic behind using the covered option call strategy is to reduce long-exposure in an underlying asset and to collect option premium. A lot of traders, and certainly a lot of investors, don’t want to fuss with using sophisticated options trading strategies to try and generate fancy returns. This is why covered calls are so great. They are very simple to trade and they carry the exact same downside risk as owning a stock! Actually, they carry less downside risk because the premium received from selling the calls offsets downward moves in the underlying, although it’s often minimal. If you manage to sell covered calls for a long enough time without having the stock (or futures contract, etc.) called away from you, it is theoretically possible to generate enough income to reduce the overall cost of a long position to $0.00. The covered call option strategy is sort of analogous to buying a house and signing a contract to rent out a spare room. If the value of the house rises, you will make money on the overall house, but perhaps you will limit your gains due to the rented room with a lease that you can’t get out of; you could have rented it for more, but now you’re stuck. However, if the value of the house tanks, luckily you’ve rented out the room and will continue to collect the rent every month. And finally, if the value of the house doesn’t move at all (which is commonly the case) you will still collect all of the money from renting out the room. Covered calls function virtually the exact same way. If the end-goal is to buy a house (like a stock) as an investment, it makes sense to reduce cost-basis and rent part of it out. Theta decay for covered calls is highly beneficial. If the underlying asset doesn’t move, the short call will lose its value as expiration nears, but the underlying asset, obviously, will not. 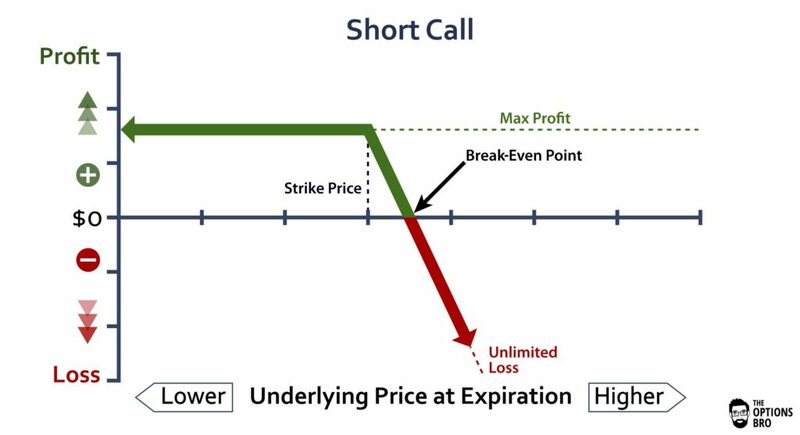 Even if the underlying asset appreciates slightly before expiration, covered call sellers will collect the full premium of the short call unless the underlying is above the strike price at expiration. This makes covered calls a very effective strategy for reducing the overall cost-basis of a long position in neutral or declining markets. Having said that, the maximum profit for the covered call option strategy as a whole is reached when the asset moves higher, hence it’s classified as a bullish strategy. When Should I close a Covered Call? It is common practice to close out the short call component of the covered call strategy if the option premium approaches zero. If this happens, there is no additional premium left to decay, so it makes sense to close it out rather than risk the chance of the premium rising. After all, the goal is to capture the premium. If the underlying asset rockets past the strike price of the short call, there’s no point in closing out the position prior to expiration, unless you are looking to avoid the option assignment fee. If it’s cheaper to simultaneously sell the stock and the call, then go for it. Option assignment fees typically range from $5 to $20. Ally Invest’s option assignment fee is only $4.95! Let that sink in! This means you can leave the whole position on and not have to do anything. Aside from having a free option assignment, this is definitely one of the cheapest rates in the whole industry! Plus, Ally Invest offers fantastic deals for the active options trader. No. Since a covered call is a covered position, the short call component will either be in-the-money or out-of-the-money at expiration; either situation is not problematic. If it is ITM, there is no need to take action. An option assignment will be assessed and the entire position will automatically fall off of the trading account by the next trading day. If the position is OTM at expiration, the full value of the short call premium will be kept and the option will expire worthless. There is no need to take expiration action with this options trading strategy. Covered call selling is probably the most common entry-level options trading strategy in the world. 99% of the time, there is no additional account or margin approval needed to sell covered calls because it is seel as so safe. If you own long stock, some traders go as far to say that it almost behooves you to be constantly selling calls against it. If the stock goes up, you keep the profits and the premium collected from the short call. If it goes down, you still keep the premium and you still own the stock. The only thing a covered call does it limit the potential max profit of a long stock position. For many traders, though, it’s worth it to risk a limited profit in exchange for the income that covered calls naturally generate. Ally Invest is the cheapest broker to trade covered calls. Up to $3,500 cash bonus + commission free trades for new accounts.